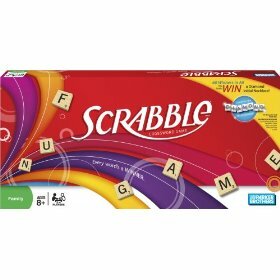 My all time favorite game as a child, and still today, as an adult, has and will always be SCRABBLE. It can be played by 4 people. You each receive a wooden rack that you use to hide your letters from the other players and develop your words. Each player has seven letters to play with at all times and each player uses the words that have been placed in the board, to work off of. As a player you are required to create words to earn points. The idea of the game is to use up all of the lettered tiles to create various words. I have always found this to be an interesting game because it always made me use my brain to think up new and different words to add to my vocabulary and knowledge. I have also used this game to help my children learn to spell better and become more acquainted with the Dictionary. I have the electronic Scrabble game that I like because then you don't have to find someone to play with. It helps when you are an only child.